Minister of Education, Mallam Adamu Adamu Has Pledged and Proffered Ways of Expanding Access to Tertiary Education in Nigeria. 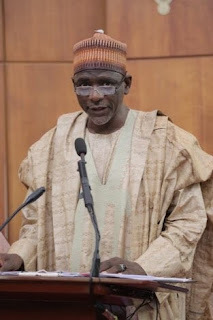 The Minister of Education, Mallam Adamu Adamu, has proffered ways of expanding access to tertiary education in Nigeria. The Minister made the suggestion at the 8th Edition of the Ministerial Press Briefing on Monday 18th March, 2019. He pointed out that the development of infrastructure in the nation’s tertiary institutions was a potent instrument of expanding access. Mallam Adamu hinted that the President Muhammed Buhari-led administration has spent over seven hundred billion naira on developing infrastructure in the nation's tertiary institutions in the last four years. He explained that the large chunk of the money went into provision of hostel accommodation, classroom blocks, lecture theatres and laboratories. He said, “This was done in a bid to have more of our qualified school leavers gain admission into tertiary institutions thereby expanding access”. Other means of expanding access, according to the Minister is by establishing or licensing new tertiary institutions. He noted that the Federal Government within the period under review, had established 30 universities bringing the total number of universities in the country to 169. The breakdown shows that Nigeria now has 43 federal universities, 47 state universities and 79 private universities which has increased the carrying capacity of the nation’s tertiary institutions more than what was inherited by the administration in 2015. The Minister stated that the current administration, in her determination to provide middle level technical manpower for the country has also given approval for the establishment of more Polytechnics, Monotechnics and Innovative Enterprise Institutions from 298 with a combined carrying capacity of of 424,715 admissions spaces in 2015 to about 517,943 spaces in 2019. According to him, this feat was due to the establishment of additional 71 of these institutions adding that similar gestures were being extended to the Colleges of Education. The Minister averred that the Federal Government had slashed the Unified Tertiary Matriculation Examination (UTME), National Examination Council (NECO) and West African Examination Council (WAEC) registration fees as part of measures geared towards increasing access to tertiary education.